With clean gypsy settings showing off the diamonds to full advantage, this contemporary take on a classic favourite is the epitome of elegance. 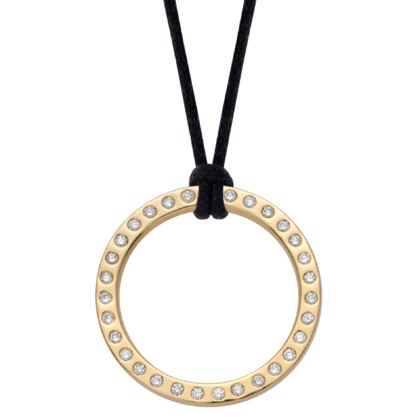 A black cotton cord knotted around the pendant completes the casual, yet refined look. Pendant: 23mm. Diamonds: 31 @ 1.3mm each & with a total of 0.31 carats. Cord: Total length 31.5" (80cm) adjustable to any length by moving the toggle nugget. The cord & pendant come as separates allowing you to interchange the pendant with a different one. Handmade in Hatton Garden with a great deal of love & expertise & hallmarked by the Goldsmith's Assay Office.